Time zones and daylight savings time have an interesting history in Alaska, a state that straddles so many degrees of longitude and has more than its share of summer daylight and winter darkness. Frank Norris’s article on keeping time in Alaska in the 2001 issue of Alaska History tells that story and is reproduced below. Copies of the issue may be ordered through the Publications page of the website. 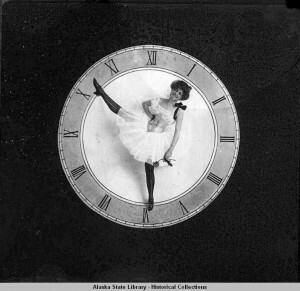 Clock face with tutu-clothed woman posing, toes pointing to 10:30. ASL-P226-723, William R. Norton Photographs, Alaska State Library-Historical Collections. Americans and Canadians established time zones for most of North America in the 1880s, and most of the continent has retained those time zones ever since. Changes in how residents have kept time have been rare and related primarily to wars, energy crises, and the imposition of daylight saving time. In Alaska, however, the issue of time measurement resurfaces with some regularity. A variety of issues central to Alaska history-rebelliousness against the sometimes unrealistic dictates of a distant federal government, Alaskans’ struggle for political unity across their vast state, and diverse economic allegiances-have all been manifested in the evolution of the state’s time zones. Society’s casual attitude toward time was also reflected in the consistency, or lack of consistency, between time keeping in various adjacent communities. In lieu of time zones, people kept time on the basis of longitude. Based on that system, clocks in Wrangell (located at 132° West longitude) would strike noon twelve minutes before those located in Sitka (at 135° West longitude). This system proved slightly vexing to ship captains and commercial traders who traveled long distances. (2) Most people, however, traveled little; thus there was little pressure to change the existing state of affairs. Because of its isolation and lack of commercial infrastructure, Alaska during this period was less concerned about time measurement than the rest of North America. Alaska and adjacent areas of Canada were splendidly isolated from Seattle, Edmonton, and other southern points; no telegraph reached the far northern latitudes, and steamship travel between Puget Sound and the nearest Alaskan port was a two- or three-day endeavor. Prior to 1900, towns in Alaska and the Yukon set their clocks to a local time based on longitude. Historical accounts from the gold rush period reveal a relaxed attitude toward time. Stampeders’ diaries, for example, often note the hour at which their train arrived in Seattle, and many diarists were also careful to note the hour in which their steamship departed for Alaskan waters. But once the stampeders disembarked in the north country, time became less important. This attitude is reflected in the general omission of time references in the early Skagway and Dyea newspapers, even for store hours or steamship departure times, and most diarists paid little attention to time once they headed inland. 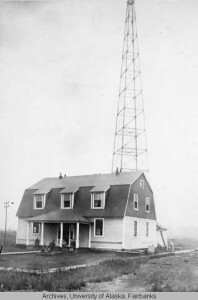 Telegraph station, Ft Gibbon, Tanana, Alaska, circa 1900. Photo by George M.
The implementation of a telegraph system, in practical terms, demanded the establishment of one or more time zones, and given the concentration of economic and political power at the time in Alaska’s southeastern panhandle, it was unsurprising that “Alaska Standard Time,” established in 1900, would be centered on the 135th meridian, just one hour before Pacific Standard Time. (6) This scheme proved suitable for the Southeast, but Alaskans elsewhere observed two other time zones, one each for central and western Alaska. These additional time zones were observed in everything except telegraphic communications. It must not be concluded, however, that Alaskans immediately became more time-conscious merely because of the increasing reach of the telegraph system. Although most Alaskans during this period paid attention to some form of time measurement-a church bell, a cannery or mine whistle, or a railroad timetable-it also appears that most Alaskans, even those in the larger towns, lived by the clock far less than today. (7) It is highly likely, moreover, that many Alaska residents during this period, particularly those in rural areas, either owned no timepieces or paid little attention to the ones they had. Not long after Alaska adopted standard time zones, territorial residents began to consider daylight saving time. World War I and the need to maximize daylight hours in armament manufacturing plants spurred national lawmakers to consider the idea’s energy savings potential. In May 1916 both Germany and Great Britain adopted daylight saving time. The idea also took hold in various U.S. states and cities; Seattle, for example, adopted daylight saving time during that summer. Although Alaskans could muster little enthusiasm for daylight saving time, Congress in March 1918 mandated the adoption of “war time” throughout the country from the last Sunday in March to the last Sunday in October. “War time” remained in force until October 1919. The law also decreed that in addition to the United States’ four major time zones, there would be a fifth zone for Alaska. “U.S. Standard Alaska Time” would be two hours slower than in Seattle. This was done either because of geographical centrality-the 150th meridian neatly bisected the territory-or perhaps because an increasing percentage of Alaskans were now living outside of the southeastern panhandle. But the act, whatever its virtues, had no enforcement mechanism. And in the words of a latter-day newspaper columnist, the use of official Alaska Time was “only compulsory on common carriers and for the various purposes of government administration.”(9) Most Alaskans, therefore, continued to honor three time zones, as they had since the turn of the century. In May 1933, Seattle launched a new daylight saving time experiment. In reaction, Juneau city council member J. B. Burford presented a daylight saving time petition “signed by many business people.” Hoping to avoid an “adverse effect on business with Seattle banks,” the council unanimously adopted Burford’s plan, and Juneau went on daylight saving time from May 24 through September 20. (11) It then reverted to standard time; and perhaps in response to Seattle, which made no further moves to experiment with daylight saving time for the next several years, Juneau also retained standard time on a year-round basis. Unofficial time zones in Alaska 1900-1940. Map by Carol Belenski. 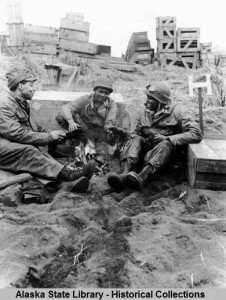 Soldiers at Massacre Bay, Attu, Alaska, May 16, 1943. ASL-P175-052, U.S. Army Signal Corps Photograph Collection, Alaska State Library-Historical Collections. But soon after the DOT’s decision, a broad spectrum of Juneau’s population rose up to protest the change. Southeast, they declared, had closer business relationships to Seattle than to the Railbelt. On March 28, 1980, voters-by nearly a 2-to-1 margin-approved a non-binding referendum favoring repeal of the DOT’s decision. Two weeks later, the Alaska State Senate unanimously passed a resolution asking that the time-change order be rescinded. Despite that vote, the federal agency refused to back down, and the switch to Yukon Daylight Time took place in late April. Some Juneau residents became so upset about the time change that they initiated recall petitions against Mayor Overstreet and four assembly members. This turn of events may have prodded DOT officials to announce that they would re-analyze their previous decision. The agency held a mid-July hearing to air citizens’ views, and on September 22, 1980, DOT Secretary Neil E. Goldschmidt rescinded the Department’s September 1979 decision. Juneau and other communities in northern Southeast reverted to Pacific Time on October 26. (21) That action, while it satisfied Southeast residents, re-aggravated tensions between Juneau and the Railbelt over the capital move issue. The government’s move to unify Alaska’s time zones antagonized many Southeast residents, who disliked being moved away from Pacific Time. They complained that it forced children to come home from school in the dark in midwinter; in addition, being in a new time zone, according to one source, had “adversely affected the business community’s efforts to communicate with Seattle.” Ketchikan residents soon circulated petitions to repeal the time change, and during the next several months additional support was gathered from either the governing bodies or residents’ groups in Wrangell, Sitka, Petersburg, the Ketchikan Gateway Borough, and various Prince of Wales Island communities. All joined a petition to make a switch from Alaska Time to Pacific Time. The petitioners pressed for public hearings, hoping to publicize their case. But in two separate 1986 rulings, the DOT rejected the petition because it would have created an arbitrary, confusing “island of time.”(25) With the exception of Metlakatla, Southeast communities have been part of Alaska Time ever since. The history of time zones in Alaska has been much more dynamic and contentious than in other states. Certainly, for many states, geography placed them unarguably within a single time zone. But even states on the frontier between two time zones have had more stable time regimes than Alaska, and residents of other states have seldom engaged in extended public debate over time systems. The only nationwide changes experienced in time zones since their establishment in the 1880s came with the introduction of daylight saving during two world wars, passage of the Uniform Time Act, or because of the energy crisis of the early 1970s, when for two years the nation observed year-round daylight saving time. In Alaska, however, several other factors have affected time regimes. Alaska’s size gives it the unique status of spreading across nearly 60 degrees of longitude, equivalent to four time zones. When the federal government in 1918 ignored that complexity and attempted to dictate that all the territory fit in one time zone, Alaskans showed a characteristic unwillingness to accept the dictates of the distant U.S. Congress. Consequently, Alaskans and the federal government observed different systems of time zones for almost fifty years. Internal Alaskan politics has also played a role. Political motives tied to Juneau retaining the state capital prompted unification of the vast majority of the state in one time zone, even at the expense of placing most of the state’s population an hour or more off sun time. Railbelt residents, moreover, were willing to go along with the move because it eased communications between Alaska and the Lower 48, and because it made satellite television transmission of sports and other live broadcasts more in synch with their daily schedules. Another factor relating to time zone dynamism has been the power of economic alliances. 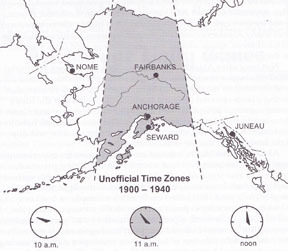 For example, between the two world wars, communities in Alaska’s Southeast moved their clocks to Pacific Time in order to more easily conduct business with Puget Sound commercial interests, and in the 1980s, businesses in western Alaska argued to be placed in the same time zone as Anchorage, the state’s business center. Over the last century, Alaska’s time zones have rarely been static for more than twenty years. There have been many local moves to revolt from prescribed time systems, and in a state spanning almost 60 degrees of longitude, many people remain unhappy with the current time system in Alaska. Future tension over time regimes, therefore, appears to be inevitable. 1. G. J. Whitrow, The Nature of Time (New York: Holt, Rinehart and Winston, 1973), 87; Michael Lemonick, “The Riddle of Time,” Time, December 27, 1999, 144; W. A. Douglas Jackson, The Shaping of Our World; A Human and Cultural Geography (New York: John Wiley and Sons, 1985), 527-29; Ian R. Bartky, Selling the True Time: Nineteenth-Century Timekeeping in America (Stanford: Stanford University Press, 2000), 12-13. 2. In the summer of 1884, a Sitka visitor made the following observation: “A fine clock is in the [Russian Orthodox] church tower, and the tourist who has kept Astoria or ship’s time realizes how far west he has gone when he finds his watch 45 minutes faster than the Sitka church clock.” New York Times, October 27, 1884, 2. 3. Jo Ellen Barnett, Time’s Pendulum: The Quest to Capture Time (New York: Plenum Trade, ), 130; Pierre Berton, The Last Spike: The Great Railway, 1881-1885 (Toronto: McClelland and Stewart, 1971), 328; Encyclopedia Americana, 1995, “time zone”; New York Times, April 19, 1883, 1 and November 18, 1883, 3. A full discussion of this process is provided in Ian R. Bartky “The Adoption of Standard Time,” Technology and Culture 30 (January 1989): 25-56 and in Bartky, Selling the True Time, 47-89, 139-46. The coterminous U.S., and all Canadian provinces except Newfoundland, still observe the same five time zones that the railroads devised in 1883, although Provincial Time is now called Atlantic Time. Many changes, however, have been made in time zone boundaries. World Almanac and Book of Facts, 1954 (New York: Press Publications, 1953), 418. 4. The Signal Corps also built a short segment between Eagle and the Canadian border, which they completed in May 1901. Daily Alaskan (Skagway), May 3, 1901. Also see the Daily Alaska Dispatch (Juneau), July 12, 1900; Valdez News, August 29, 1903 and November 28, 1903; U.S. Army Signal Corps, Report of the Chief Signal Officer for 1900 (pp. 945-60), 1901 (pp. 915-24), 1902 (pp. 661-71), and 1903 (pp. 30, 325-33). 5. Daily Alaskan (Skagway), August 27, 1901 and September 9, 1901; Ken S. Coates and William R. Morrison, Land of the Midnight Sun (Edmonton: Hurtig Publishers, 1988), 169; Alaskan (Sitka), September 3, 1904; Annual Report of the Governor of Alaska to the Secretary of the Interior, 1901 (pp. 39, 77), 1902 (p. 50), and 1903 (pp. 26-27); Major Gen. A. W. Greely, Handbook of Alaska (New York: Scribner’s, 1909), 260; Valdez News, October 8, 1904; Report of the Chief Signal Officer for 1903 (pp. 32, 332), 1904 (pp. 357-69), and 1905 (pp. 171-200). Quesnel was the northernmost point in the British Columbia telegraph grid. 6. Annual Report of the Governor of Alaska, 1901, 73. 7. Alaska historian Robert N. DeArmond notes one colorful example of a town’s deviance from standard time: “For many years on Gastineau Channel the Treadmill mine blew a noon whistle by which many people on both sides of the channel set their clocks. A problem was that Treadwell’s clocks were half an hour different than standard time, . . . so it was common, when a time was to be specified, to announce that it would be ‘1 o’clock by the Treadwell,’ etc.” DeArmond to the author, March 24, 2000. 8. Seward Gateway, October 2-3, 9, and 23, 1916; Mary J. Barry, Seward, Alaska; a History of the Gateway City, Vol. II: 1914-1923, the Railroad Construction Years (Anchorage, the author, 1993), 46. The Seward Gateway on October 2 also stated that “Ketchikan is one town which has just gone back to normal time after putting its clocks ahead,” suggesting that Ketchikan experimented with daylight saving time during 1916; but a perusal of the Ketchikan Daily Progressive-Miner for April through October 1916 showed no such activity. 9. Congressional Record, 65th Cong., 1st sess., 1917, 55:4355; Fairbanks Daily News-Miner, February 7, 1942. 10. Daily Alaska Empire, May 21, 1926 and May 19-20, 1933. The May 20, 1933 issue noted “This is the first time daylight saving time has been tried out in Juneau in several years.” But a perusal of springtime issues of the Empire between 1925 and 1932 casts doubt that Juneau experimented with daylight saving time between 1919 and 1933. 11. Daily Alaska Empire, May 6, 19-20, and 24, 1933 and September 20, 1933. 12. Merle Colby, A Guide to Alaska, Last American Frontier, American Guide Series (New York, Macmillan, 1950), xxxv. 13. Daily Alaska Empire, May 20, June 6, and July 6-8 and 22, 1939, and April 3 and 30, 1940. One of the few Juneau Chamber members who opposed the change was grocer Frank Garnick, who exclaimed, “What are you going to do with that extra hour in the evening, anyway? You’re running yourself to death as it is.” The city council actions of various Southeast communities, independent as they were, had no bearing on the official Alaska time zone that had been legislated by Congress in 1918. Legislative Reporting Service, [Alaska Legislative] Report, 1967, 21. 14. Seward Bulletin, February 9, 1942; Fairbanks Daily News-Miner, February 9, 1942; Daily Alaska Empire, February 9, 1942 and September 29, 1945. An Alaska map published by the Kroll Map Co. of Seattle-undated, but probably drawn during World War II-suggests that all of southeastern Alaska followed Yukon Daylight Time except for Annette and Duke Islands, southwest of Ketchikan, which followed Pacific Daylight Time. Kroll Map Co., “Alaska,” in author’s collection, courtesy of Bruce Greenwood. 15. Congressional Record, 79th Cong., 1st sess., 1945, 91:8466, 8540; Daily Alaska Empire, September 29, 1945. 16. The 162nd meridian dividing line, new since the outbreak of World War II, meant that Bethel was now on Alaska Time, an hour later than it had been in prewar days. Alaska, during this period, was one of just a handful of states or territories where none of its residents observed daylight saving time. 17. Anchorage Times, May 14-15 and 21-22, September 29-30, and October 6, 1954. 18. Legislative Reporting Service, Report for 1960 (p. 135), 1961 (pp. 124, 164, and 181), and 1963 (pp. 46-47); Daily Alaska Empire, March 27, 1961, A1 and March 20, 1963, 2; North Wind, May 1965, June 1965, September 1965, October 1, 1965, and October 15, 1965. The Yukon Territory soon withdrew its action regarding Pacific Time; by 1966, it was back on Yukon Time, though it also observed daylight saving time. Pacific Northern Airlines, “Alaska Flight Maps,” 1966, courtesy of Bruce Greenwood. 19. Congressional Record, 90th Cong. 2nd sess., 1968, 112:6009-10, 7565, 8285; Juneau Alaska Empire, April 26, 1968, 8. The federal Department of Transportation, just a year after its September 1966 establishment, proposed shifting southeastern Alaska back to Yukon Standard Time. Local communities, however, fought the change and it was put on hold-at least for the time being. North Wind, September 1967, 2. 20. Juneau Empire, September 21, 1979, 1; Alaska Economic Report, September 29, 1979, 2; Southeastern Log, November 1979, 2. During DOT’s public comment period for the proposed change, only six of the 26 received comments supported the time change. 21. Southeastern Log, April 1980, 28; May 1980, 13; July 1980, 13; August 1980, 5; Alaska Economic Report, June 18, 1980, 6; Juneau Empire, September 22, 1980, 1. On August 26, Overstreet and the four assembly members survived the attempt to oust them from office. 22. Alaska from the Inside, January 26, 1983, 3; Alaska Legislative Digest, March 27, 1983, 6; April 2, 1983, 5; April 16, 1983, 7; House Bill History, 1983-1984, 446-47; Senate Bill History, 1983-84, 838. As noted in the Alaska Economic Report, March 24, 1983, 7, opponents of the capital move pushed the measure, hoping that “the time shift will help put the bitter Alaska capital move issue to sleep.” Voters rejected the capital move 96,931 (52.9%) to 86,312 (47.1%). Juneau Empire, November 11, 1982, 1. 23. Juneau Empire, September 16, 1983, 1-2; Nome Nugget, September 22, 1983, 1. In the hearings, a group of Anchorage and Juneau residents testified in support of the change, although there was “some opposition” from Fairbanks and Ketchikan. 24. Milepost  (Anchorage: Alaska Northwest Publishing, 1985), 494. Because the time-zone boundary change brought so many Alaskans into a single time zone, Alaska’s two senators acted to change the names of Yukon Time to Alaska Time, and the name of Alaska-Hawaii Time to Western Pacific Time. After modification through the legislative process, Yukon Time was changed to Alaska Time and Alaska-Hawaii Time was renamed Hawaii-Aleutian Time. This law also changed the name of Bering Time, which by then did not apply to any Alaskan territory, to Samoa Time. Ketchikan Daily News, October 29, 1983, 1; Alaska Magazine, August 1984, 30; Congressional Record, 98th Cong., 1st sess., 1983, 129:29511-12, 29524, 29570, 32700, 34225, 34227, 34684. According to DOT official Joanne Petrie, Indian reservations are not bound to follow time zones imposed by neighboring jurisdictions. Given that independence, Metlakatla tribal members reiterated their interest in keeping Pacific Time in the November 1984 vote, and the community has remained in Pacific Standard Time, on a year-round basis, to the present day. Judy Lauth (MICC executive tribal secretary), interview with author, March 20, 2001. 25. Alaska Magazine, March 1984, 20 and February 1985, A4; Anchorage Daily News, April 23, 1986, C4 and July 10, 1986, C4; Juneau Empire, October 3, 1984, 12 and April 23, 1986, 2; Alaska Economic Report, September 9, 1985, 5; Ketchikan Daily News, September 4, 1985, 4; September 24, 1985, 4; October 8, 1985, 1; November 17, 1985, A3; December 29, 1985, B2; and July 8, 1986, 1; Joanne Petrie (DOT) to author, email, February 23, 2000. On December 1, at least one Ketchikan business unilaterally switched to Pacific Standard Time. Southeastern Log, December 1983, A4-A5; January 1984, A-18. 26. Anchorage Daily News, August 4, 1993, B1-B2 and November 3, 1993, B5; Herb Anungazuk, interview with author, March 15, 2001; Philip Ahkinga to author, fax, June 13, 2001; Philip Ahkinga interview with author, June 13, 2001.